Providence, Rhode Island -- Brown Men’s Rugby scored 24 points in the first 17 minutes and never looked back as the team defeated the University of Pennsylvania 58-5. 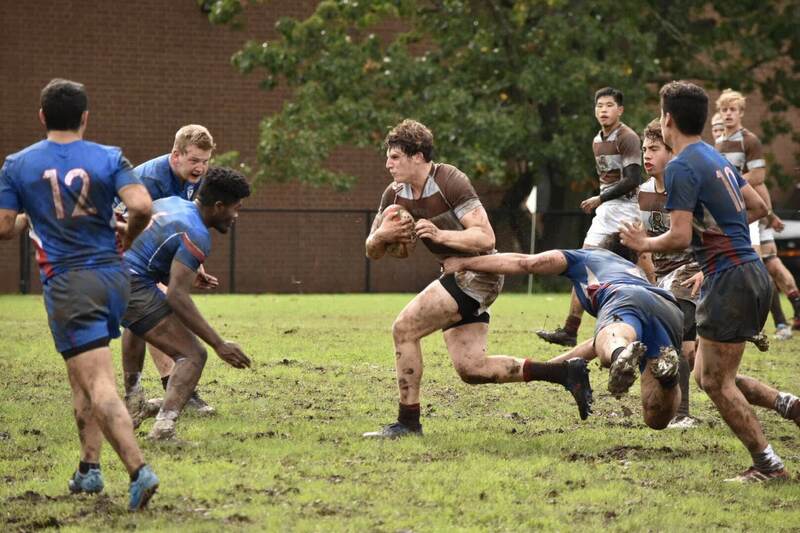 Several inches of rain, the remnants of hurricane Michael that had devastated parts of Florida and Georgia, created extremely slick and muddy conditions on the Brown Rugby Field. The potential for poor handling and difficult set pieces could have resulted in a far different match result, but Brown handled the field conditions well and dominated all aspects of the match. Former number 10 Alex Ogilvy, now playing fullback, took a pass down the sideline and ran untouched for the first try of the match. Minutes later, wing Hudson Lee took the ball to the line from 22 meters. A high tackle was called on the Penn defender as he drove Lee into touch, and Brown was awarded a 7 point penalty try. Captain Jae Kim and wing Christos Economos each followed up with unconverted tries to give Brown a 24-0 lead. Brown let up defensively for the next 20 minutes conceding one Penn try and unable to regain its offensive dominance. However, Brown more than made up for the Penn try as center John Kim scored and then scrum half Peter Smith faked a pass from a ruck at the Penn 22 meter line and ran untouched under the posts in the last two minutes of the half for a 34-5 Brown advantage. With some defensive adjustments at halftime and the replacement of injured captain Jae Kim by A.J. Berman, who brought fresh legs to the forward play, Brown duplicated its fast first half start as Economos ran through three defenders from 15 meters to add a five point try in the seventh minute of the second half. Brown scored 24 second half points with the Bears dominant at both scrums and lineouts and on defense gave Penn few opportunities. Notable in the mud was the play of Austin Royer, Streator Bates, Chase Bekkerus and Constantin Gardey. At 60 minutes Adam Eberle replaced Chase Bekkerus at flanker, Justin Vandervelden replaced Hudson Lee at wing and Jack Schaeffer took over at fullback with Alex Ogilvy replacing John Kim at center. Brown finished off the match with three tries as Schaeffer passed to Vandervelden in the 64th minute, number 10 Sean Lumkong ran a scrum play from 15 meters at 74 minutes and flanker Streator Bates took a pass off a ruck running 15 meters for the final try of the match at 79 minutes. Ogilvy converted the final two tries.